Yesterday night I had a Chemistry experiment to do at home, bake cookies. Naturally, being cheap, I wanted to get all of the ingredients as cheap as possible, so I headed over to the 99 Cent Store! Anwyay, it took me a while to gather all of the ingredients and get to the checkout stand. Once everything was paid for, I was ready to head out on my way. It was then I realized, NONE OF MY GROCERIES WERE BAGGED. I saw the store had no plastic bags at all, and I asked the cashier why. “The city banned plastic bags!” he said. So the city abolished plastic bags to save the environment eh? If I wanted to get a bag for my stuff I’d have to pay extra, and me being too cheap I opted out. Thanks to the city’s new ordinance I had to carry a jumble of materials that I could’ve dropped at any moment! Plastic bags are banned in Huntington Beach, the location of the 99 Cent Store I was at. Thank God I live in Fountain Valley, where I’m free to carry around my petroleum-drilled and extremely useful pastic bag. Yes I understand that it’s necessary we save the environment, but is it really necessary to ban plastic bags in a whole? It might get people to bring recycleable bags, but what about the people who didn’t know or forgot about the law? Why charge them extra? Personally, I don’t think plastic bags should be completely phased out, but if we are really serious about conservation then there should be more awareness. People should be encouraged to recycle their plastic bags and cashiers should be advised to use less of them. That’s a much better alternative to completely abolishing them. Let me know your thoguhts, commenters! 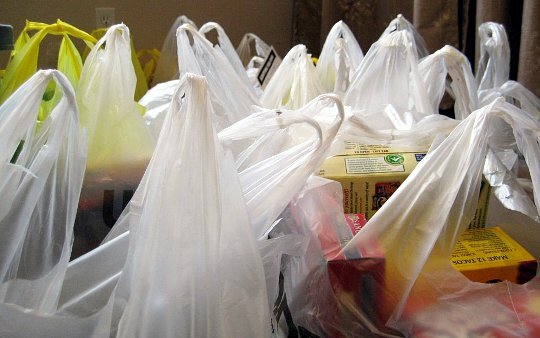 Do you think plastic bags should be banned entirely, or not? This was a dumbfounding and confusing experience for me. I look forward to reading your feedback! By the way, the cookies were way too sweet.